The Hedonic Haptics player is a portable wearable device that plays back vibrotactile compositions. 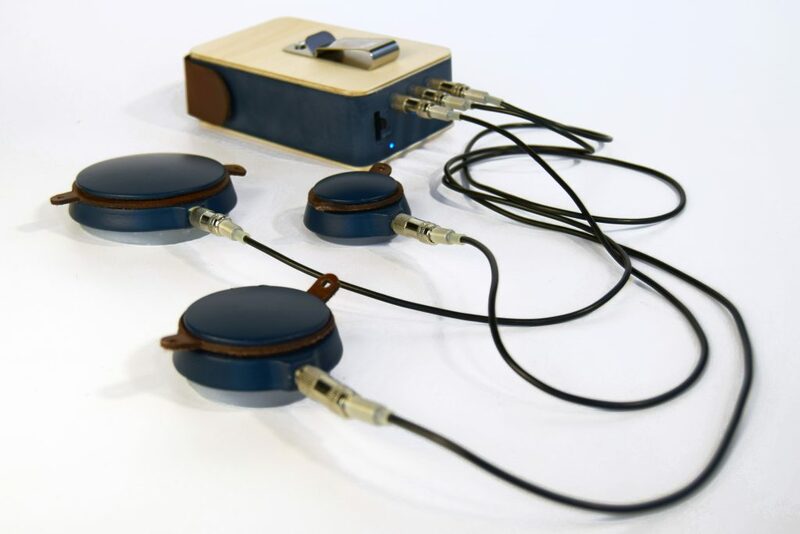 It consists of three domes each of which houses a vibration motor providing vibrotactile sensations to the wearer, and which are connected to a control unit the size of a small Walkman. The Hedonic Haptics player can store up to ten different compositions made up of haptic signals varying in amplitude, waveform and length. We use these different compositions to explore the hedonic potential of vibrational haptics in an embodied wearable setup. Vallgårda, A., Boer, L., & Cahill, B. (2017). The hedonic haptic player. International Journal of Design, 11(3), 17-33. Laurens Boer, Anna Vallgårda, Ben Cahill. (2017). Giving Form to a Hedonic Haptics Player. In Proceedings of DIS’17, Edinburgh, UK, June 12-14, pp. 903-914. Laurens Boer, Ben Cahill, Anna Vallgårda. (2017). The Hedonic Haptics Player: A Wearable Device to Experience Vibrotactile Compositions. In Proceedings of DIS2017 Companion, Edinburgh, UK, June 12-14, pp. 297-300.